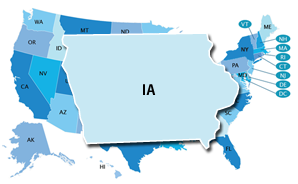 Iowa allows students to earn dual credit in academic and/or CTE dual-enrollment courses through Senior Year Plus, dual-enrollment, and articulated courses at their high school, postsecondary institution, or online (e.g., Iowa Communications Network [ICN]). Public postsecondary institutions are not required to accept these credits (Education Commission of the States, 2015). The Gateway to College National Network partnered with an institution of higher education to provide one Early College High School as part of the Early College High School Initiative (ECHSI). More information about schools participating in ECHSI is available at the ECHSI website (Jobs for the Future, n.d.). Within these areas, Iowa implements programs of study aligned with all 16 Career Clusters ((National Association of State Directors of Career Technical Education Consortium, n.d.). In 2008, Iowa mandated that all students in Grades 8–12 have an 8th Grade Plan (U.S. Department of Labor, 2013). The 8th Grade Plan is an electronic portfolio that incorporates assessments and surveys, career research, course plan building, education linkages, and financial aid and career development activities. Students can revise their career and educational plans as their interests and goals develop (Iowa Department of Education, n.d.). The Iowa Department of Education provides broad parameters for student graduation and requires districts to establish more detailed graduation requirements that include the types of courses and number of credits. The level at which Early Warning System data are reported and who can access the data is not publicly available.